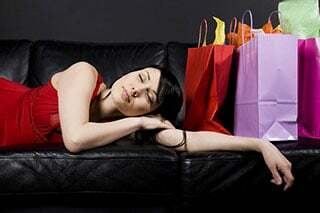 “Compulsive Buying Disorder” – or “spendaholism” or being a “shopaholic” – is characterized by poor impulse-control. It has the potential to create emotional and financial distress, both of which can wreak havoc on a marriage. Have you ever noticed that people can be divided into two groups when it comes to their attitudes towards money? Some people are spenders and others are savers. In these two groups, some people fit towards the middle of the scale – saving a little more than the spend, or vice-versa – and some are extreme examples at the far end of either spectrum – a millionaire who lives in a bachelor apartment and shops at the Dollar Store because he can’t bear to part with a dime, or someone who is about to lose their house to the bank because they literally can’t stop buying stuff they don’t need from the Home Shopping Channel. You can tell when two savers get married. They have a high rate of savings and investments and tend to live on less than they earn – putting away money towards retirement and the occasional big-ticket item, such as a car, annual vacation, or home renovation. Credit scores are high and they handle money with sensibility and delayed gratification. When two spenders tie the knot, their finances may be a bit more precarious since words like “spending plan” or “budget” are usually not part of their lexicon. Both spouses enjoy gathering toys, traveling frequently, and spending money rather than saving for a rainy day. As long as they continue to make more than they spend, money problems have a minimal impact on their total financial picture. When married spenders are living beyond their means, all the ingredients are in place for a recipe of maxing-out credit cards and turning into a personal debt disaster. The third scenario is when a saver marries a spender. Over time, the values the saver holds dearly will be tested time and time again. Good luck trying to talk to a spending personality about deferred satisfaction incurred while accumulating retirement savings or watching their college funds grow over time! It does not compute to the spender who is generally a person who wants to live in the moment and not forego the current satisfaction they get in the actual process of purchasing items. This final scenario is one that I see often in my work as a forensic accountant. In this case, spouses were of a like mind – either savers or spenders – when they first met and married. Over time, one of the parties changed in their money habits and became either a spender or saver while their spouse remained firm in their original money type. Or sometimes, the spender was able to control – or hide – their spendthrift tendencies during the early days of the relationship – but when the romance died, so did their reason for controlling their spending. A study published in the Journal of Consumer Research (December 2008) suggests that as much as 8.9% of our population, approximately 25 million Americans, may be considered to be compulsive shoppers/spenders. This is not an isolated problem and it co-exists equally between the genders, according to a 2006 study from Stanford University. Psychologists call it “Compulsive Buying Disorder,” which is characterized by poor impulse-control. It has the potential to create emotional and financial distress, both of which can wreak havoc on a marriage. Others refer to it as “spendaholism” or being a “shopaholic.” The long-term consequences can be devastating with broken relationships, job issues, ruined credit history and general financial troubles extending over a period of time. Abraham Lincoln’s wife, Mary Todd Lincoln, was apparently addicted to shopping. She would run up large bills on credit and carefully conceal them from her husband. On one occasion, she allegedly purchased 300 pairs of gloves; another shopping expedition saw Mrs. Lincoln spend $3,000 on jewelry and $5,000 on a shawl. She would get an emotional “high” from spending the money followed by a depressive reaction when needing to pay. She referred to it as “stress relief” from her duties and responsibilities as First Lady. Many years ago, a potential client came to see me. He had filed for divorce due to this exact problem. He was not aware his wife had racked up personal debt of $40,000 during their marriage; she did everything she could to hide it from him until the creditors started calling at night and she had to confess. They went to counseling and worked out the underlying issues that was causing her to consistently overspend – or so they thought. Then two years later, he found out she had put them into large credit-card debt again. That time, she used some inheritance money of her own to pay it all off and swore it would never happen again. You see where this is heading? It happened a third time over the same eight-year period, and the husband decided to file for divorce. She was undermining the future financial security of the family, and he had had enough. Your spouse has become a big fan of the mailman – rushing to bring in the mail the second it arrives. They conceal shopping habits by hiding bags. New, unexplained items show up in your home. Your spouse applies for a credit card without telling you. They handle all the household bills and make sure you never see them. There is a new secrecy surrounding money. There are periods of unexplained absence. It is my experience female spendaholics tend to buy many small items – including clothing, shoes, handbags, and items for the home and children. Male spenders generally purchase fewer, but larger items – such as motorcycles, cars, and golf equipment. I worked on one case where the spouse owned over 39 sets of golf clubs. Men also utilized more spending money through ATMs and cash withdrawals than women; women tend to get their pocket cash while in the grocery store or bank. One of the main reasons spending is secretive is due to the type of products/services being purchased. If you are spending money on bad behavior that you cannot afford, that is a double whammy to a spouse. Gambling, alcohol/drug dependency, overeating, or adultery are examples of addictions that can become out of control. These behaviors encourage addictive individuals to spend more and more, often incurring large credit-card bills and personal debts. In many cases, spouses are raiding their retirement assets of children’s college accounts to fund their addictions. Many of these secretive behaviors can go on for years undetected. What could trigger bouts of spending addiction? A marriage that does not have a transparent wrapper around the finances, or poor communication, could easily set up a situation where overspending might occur. Secrecy, motive, and concealment are the other variables needed to carry on a spousal ruse. It may also stem from an emotional subconscious desire to get back at the spouse for some slights, whether real or imagined. Enjoyed the friendliness of retail workers. Felt a “retail high” while shopping that became an addiction. Never added up all the credit-card balances – just continued to open new accounts. Keeping up with their stature in the community. Arguments or anxiety spark an urge to shop and then hide the goods. She had an affair, so I took the credit card to get even. I make the money, so I can spend it as I like. When two savers get divorced – assuming one of them hasn’t recently acquired a love-interest with expensive tastes – the financial statement is unlikely to come as a shock to either one of them. They have a pretty good idea of what they have, and there are financial and real assets to divide in the property settlement. When a saver and a spender divorce, things are usually messy: both financially and emotionally. The saver is outraged at the amount of debts racked up by the spender – and by the news that he/she may be on the hook for those debts during and after divorce. If you’re the saver in a divorcing couple, you need to speak with a lawyer and a financial professional immediately to find out what you can do to stop hemorrhaging money before your divorce is final. Some of the most difficult divorces are those families where both spouses are spenders. There may be few financial or real assets to split in the property settlement. Good luck trying to craft two full sets of personal expenses out of a family unit that is in the habit of spending all the income that is generated! The news is not good for couples who have been living beyond their means: when they get divorced, their debts generally exceed their assets, and they end up trying to split the debt equitably – which could result in one or both of them having to file for bankruptcy. There may be no other option. That is the day of reckoning for many poor financial spending habits. In my next article, I’ll discuss financial strategies to help saver-spender and spender-spender divorcing couples improve – or at least manage – the financial outcome of their divorce. I don’t plan to divorce, and I am reading this because I am married to a debtor, a money addict and even after the secret spending is not in the picture, there are compulsions that disturb a marriage. I was looking for a little validation that I am doing a good job. I suppose I saw it, I have held on long past three surprise debting cycles. It’s an addiction, a disease like alcoholism and takes tremendous patience, help and creativity to stay married to such types. I go to 12 step myself to learn to deal with it, I suspect debtors are more difficult to stay in relationship to than alcoholics or even drug users. Well, good luck to me and I answered​ my own question. Bless us all.